Acupuncture is an ancient healing art developed over the last 4,000 years, predominantly in China. 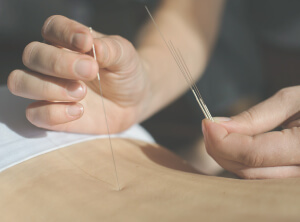 Working on the body’s vital energy flow, very fine needles are inserted into acupuncture points so that the body’s healing response is stimulated to restore it to its natural state of balance. Acupuncture stimulates the nerves in skin and muscle, and can produce a variety of effects. We know that it increases the body’s release of natural painkillers – endorphin and serotonin – in the pain pathways of both the spinal cord and the brain. This modifies the way pain signals are received. Acupuncture treats the whole person, rather than symptoms in isolation, working to improve overall well being through helping to recover equilibrium between mind, body and spirit. 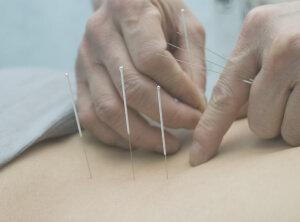 Acupuncture needles bear little resemblance to those used in blood tests and injections. They are much finer and are much less painful. When a fine needle is inserted a slight prick may be felt or nothing at all. A tingling or heavy sensation is often felt when the acupuncture point is reached. The number of needles varies greatly but may be only two or three. While the needles are in place (usually 20 minutes or more) a feeling of pleasant relaxation is often experienced. At the initial consultation, we take a full history and diagnose both the underlying problem/s and the likelihood of acupuncture to alleviate the symptoms. Each patient’s case is assessed by the practitioner and treatment is tailored to the individual. Treatment might be once a week at the start, then at longer intervals as the condition responds. The length of a course will vary with the nature and duration of the problem, individual constitution and response to acupuncture. A typical course may involve 5-8 treatments, after which a review is conducted. Longstanding conditions may take longer to improve, while more recent conditions tend to respond more quickly. Our physiotherapists who use acupuncture are fully qualified members of the Physiotherapy Acupuncture Association (AACP). All needles are pre-sterilised and disposable.